After the mild restoration of my original Astute, I've decided to try and get myself a Super Astute. I always wanted one and they are somewhat to on the ground. 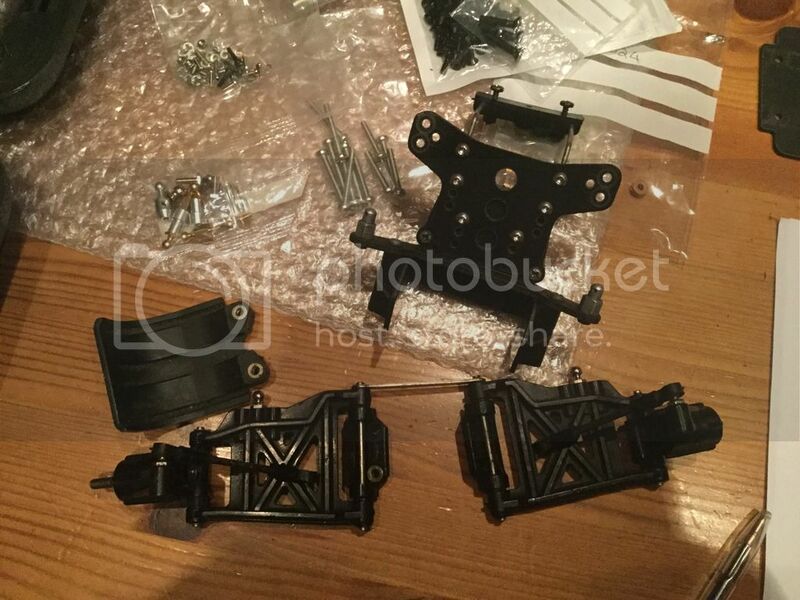 Luckily i managed snag myself a bargain chassis with other assorted bits on eBay which arrived a few days later. 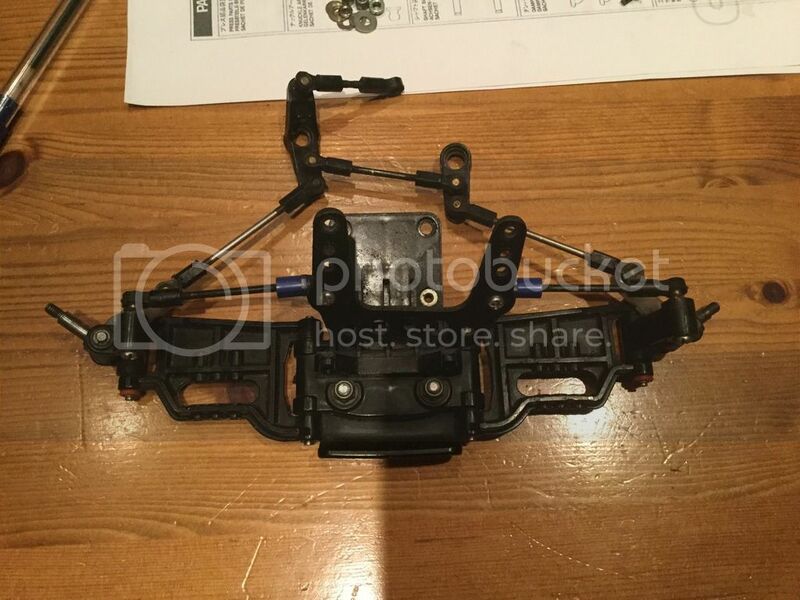 Below is the chassis that arrived. 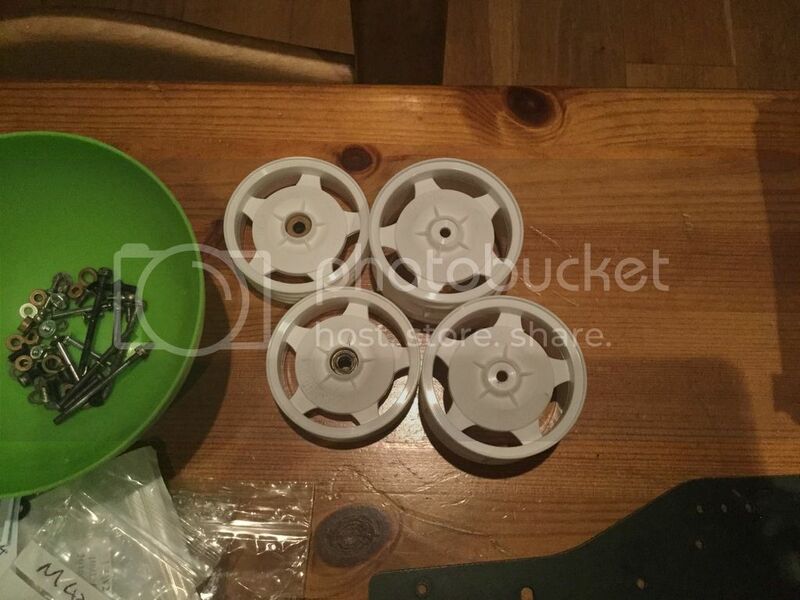 Also included were a set of white star dish wheels, and a repro body and under tray. The lower arms are scratched with chunks missing from them. The rubber o-rings on the lower arms are perished and split. The bulkhead reinforcement piece is cracked. The adjusters dented and damaged. 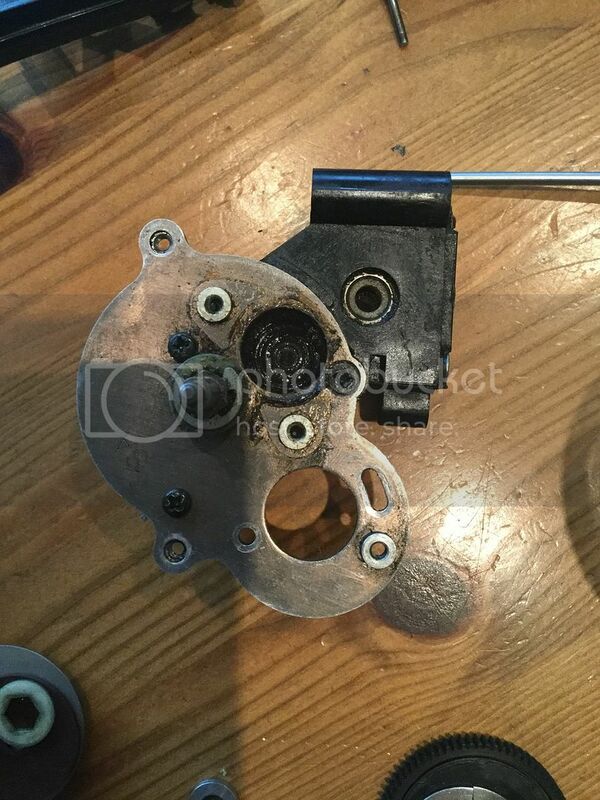 The damper mount is scuffed and worn on the top edges. Many of the screw heads are stripped. There are screws missing completely. The is quite a lot of play in the steering mechanism. So all in all a positive start! Super astutes are awesome (I have 2, one is my favorite runner/ racer). Shame about the front arms they are quite rare now. And a shame about the front bulkhead but that was going to happen, it s the most fragile part on the SA. If I were you I wouldnt bother getting another original one if the car is going to be a runner, you should get a 3d printed one, much stronger. Check your rear susension arm mounts they are prone to breaking as well and check your main gear shaft which is also a weak point. If you need help or parts feel free to pm me . Best of luck with the rebuild, the car is really worth it ! My Super Astute runner has all of the ORB Racing printed parts. All parts are improved design and so far....... no failures ! 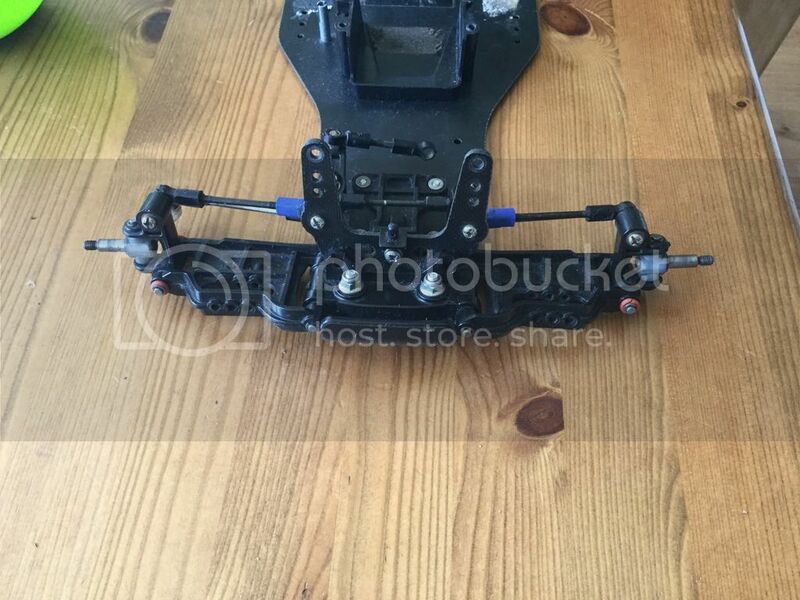 Front and rear bulkheads, front support, rear arm mounts and steering arms are a must. Not all ORB parts are listed on Shapeways from what I see, so best to contact Paul and Koen direct or via their FB page. Thommo is spot on ! I hesitate to name ORB racing because I didn t know whether it would be considered promoting/ advertising. But yes get ORB parts both my super astutes and both my dyna storms have ORB printed parts and I have been running and racing them for years with no problems. I would have the same reservation about reproduction or replica parts such as bodies and decals but the fact that ORB have designed from scratch, their own custom replacement parts......... all clear ! They are not trying to reproduce the original part in the way that body or sticker reproducers are. Ah ha, that explains it. Thanks for the info. I'm determined to get my Super Astute up and running for vintage racing. I've had it since I was 13 and it's about time I gave it the attention it deserves. I was also thinking of re-designing the main gear shaft cog (that sits behind the slipper assembly) & getting it 3d printed in alloy. It looks like a weak point. Rear shock tower mount corner worn. Rear lower arms scratched and chipped. Weird clutch assembly arrangement with different spur. So lots to do at the back end too! Yes the ORB racing stuff looks interesting. I'm thinking of doing this as an original shelfer (mostly) and then doing a kind of 'Ultra Astute' using as many alternative parts as I can - I've already got a comprehensive list of what I want to get for that project. wow that slipper clutch looks knackered ! The slipper plate probably broke because of the different spur gear which made the plate sit lopsided. Good luck the main shaft isn t broken. Also normally the SA has universals at the rear and not the dogbones you ve got, those appear to be standard astute parts. Have you opened the reat diff yet ? By the way if you get stainless steel hex heads get some good ones not the cheap sets you find on fleebay and in japan otherwise the hex imprint will start slipping and strip and you ll be in trouble. 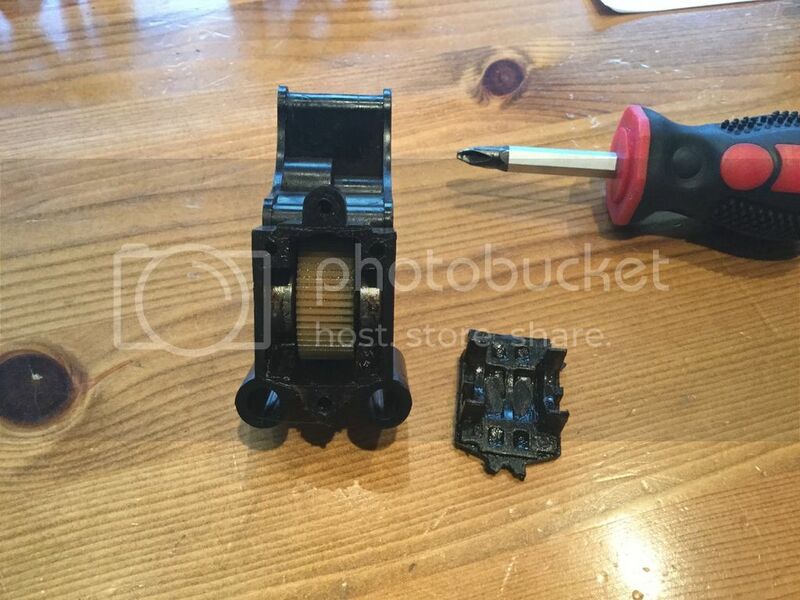 Don t forget screwing metric 3mm into plastic really requires you to thread the platic part with a tapping tool. t3garrett I'm gonna be honest, at this point it's mostly new parts! I'll add the UJ's to the list of bits I need. 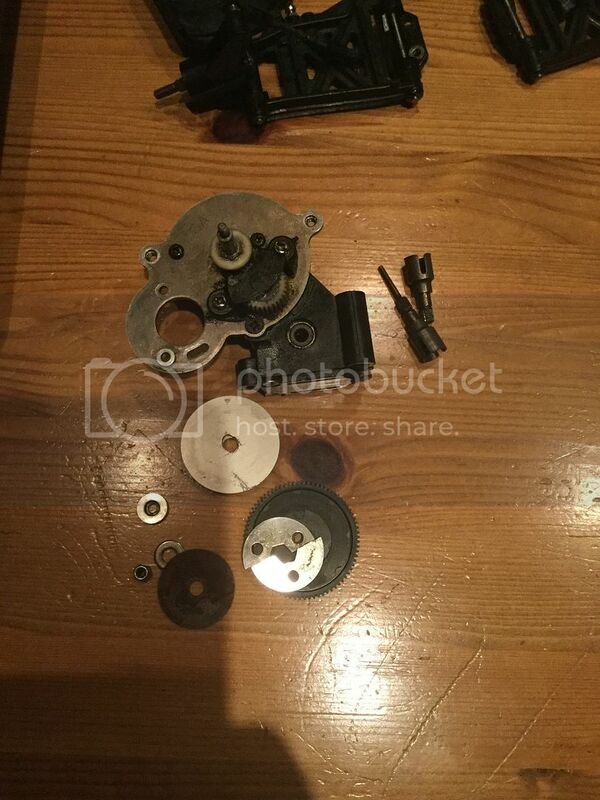 Is there any easy way to get the right parts? I'm going to strip down the gearbox tonight so we will see what we have in there! 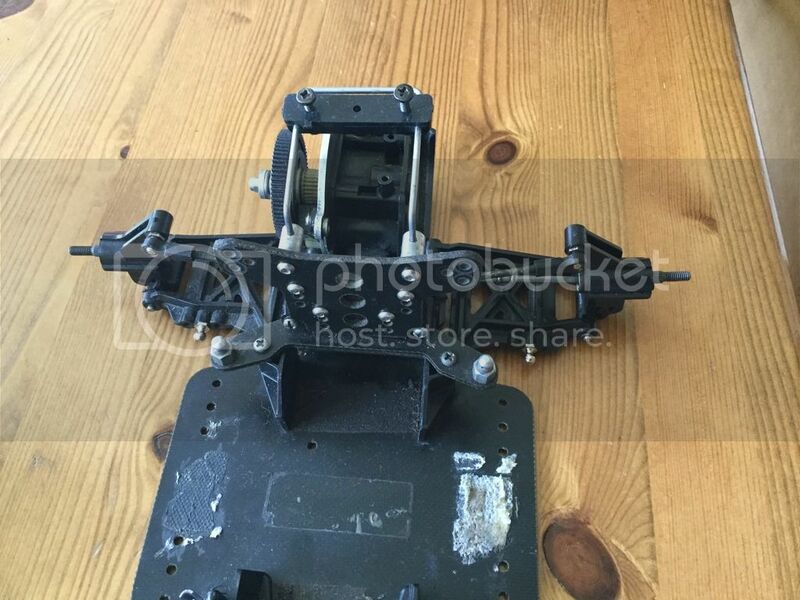 Question, I want to replace the chassis plate to make it like new. I can see standard plates on the bay - shall I just get one and carefully drill and countersink the additional holes I need for the SA? I don't want to buy a carbon fibre part - wanna keep it as close to original as possible. Or does anyone have a genuine new SA plate they would part with? Just checked the manual and it seems to show that the SA had dog bones. Are you sure it had universals? Another question - is the gearbox casing H4 and lid H2 the same between Astute and Super Astute? To my knowledge, Astute and Super astute chassi plates are identical, again I'm only going on my 2 astutes and my 2 super astutes, the excess screw holes on the SA are not used and that is all. So you can get a new astute one. Gearboxes and gearbox lids are identical between the 2 cars. No problems there, the differences reside in the internals. After looking at the photos of your gearbox more carefully on the big screen of my PC, the spur gear and big aluminium slipper clutch plate come from the db01 or the trf201 (or the slipper option for the dn01 ). I would advise you rebuild it to the manual specs. These mods have been done because the problem with the SA slipper clutch is that it is very hard to set up. It is an excellent clutch but very (too) delicate to tune. 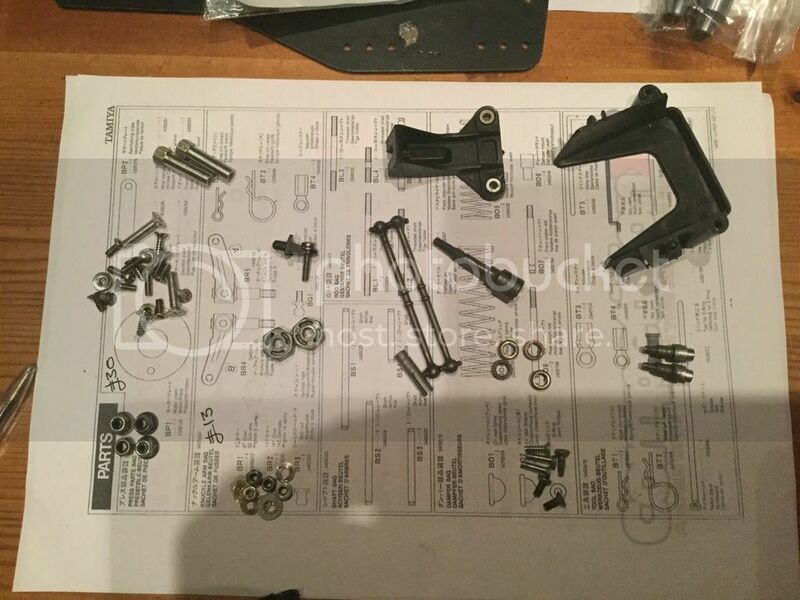 Because of the lack of a spring like on most slippers and the use of just a thrust bearing and disc springs and also the small tread at the end of the main shaft only a 1/4 of a turn on the lock nut will take you from slipping to complete locking of the clutch. 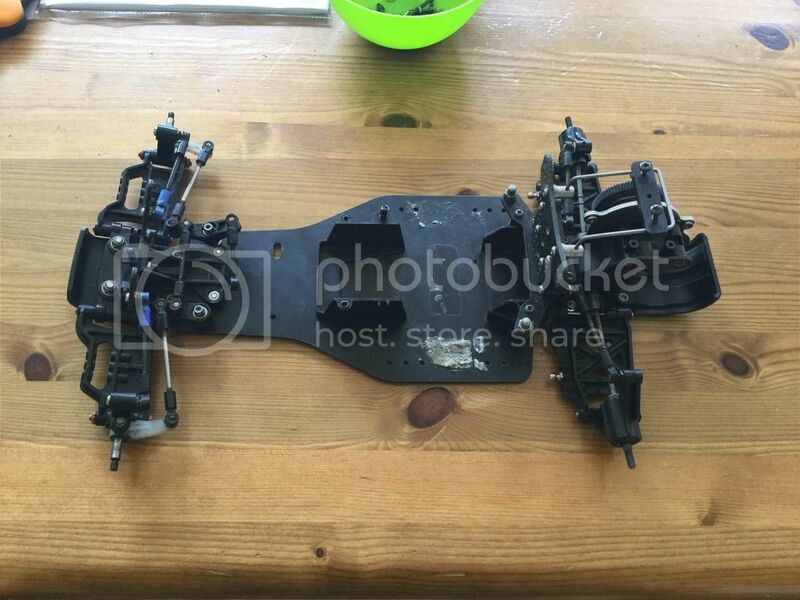 Yep I've already got the gearbox internals and ordered the slipper parts - just waiting for them to come. Going to rebuild it as per the manual! Interesting to know where the parts came from though. This car had been raced hard - to be honest there's not going to be much left of the original chassis when it's finished. Motorplate is different, the Super Astute one is brownished with the writing SA. The gearbox main case seems identical but it's different. Astute and Super Astute have the dogbones. 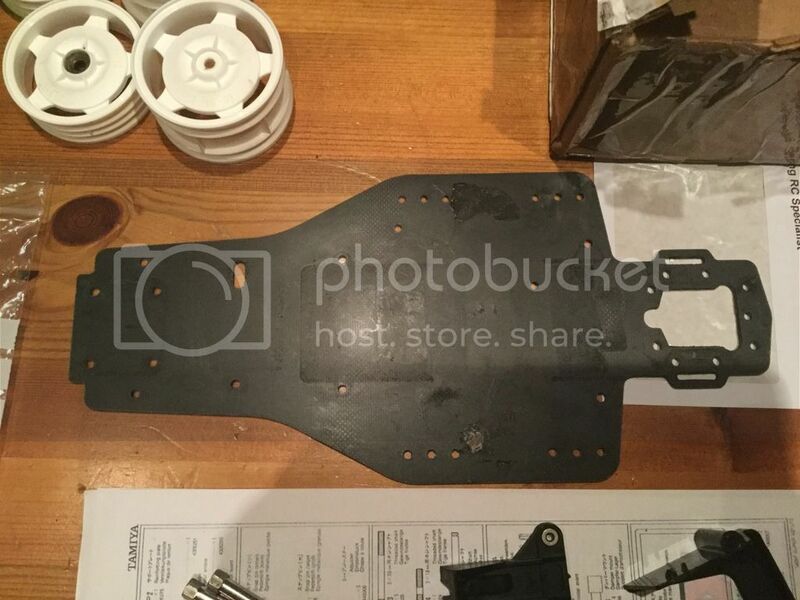 Chassis plates and other FRP plates are identical. Thanks Kontemax. 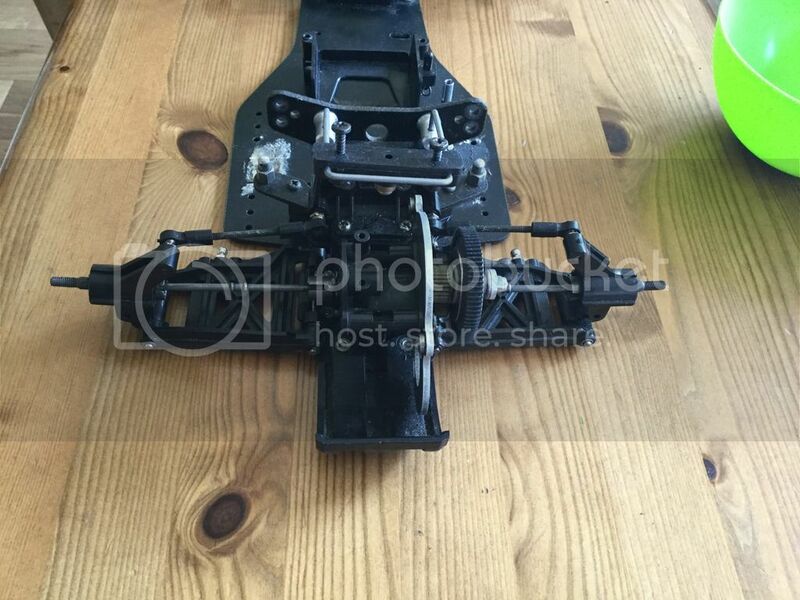 Actually the chassis plate for the SA has the two additional holes in it for the front battery mount that are not present on the Astute plate. Sooooo... should I buy an available Astute plate and drill it? It wouldn't technically be correct but who would know? Could I live with myself knowing it wasn't technically the correct part? Is there something wrong with me that this kind of detail bothers me? Also agree about the gearbox casing. The SA one seems to have an additional hole in one side that you fit the A3 part and main shaft into, whereas I don't think the Astute has this. This is because the SA main shaft actually rotates as part of the slipper clutch design and so needs a bearing on both sides to rotate inside. On the Astute the gearbox shaft is fixed and I think the spur gear spins on the shaft as there is no clutch assembly as part of it. 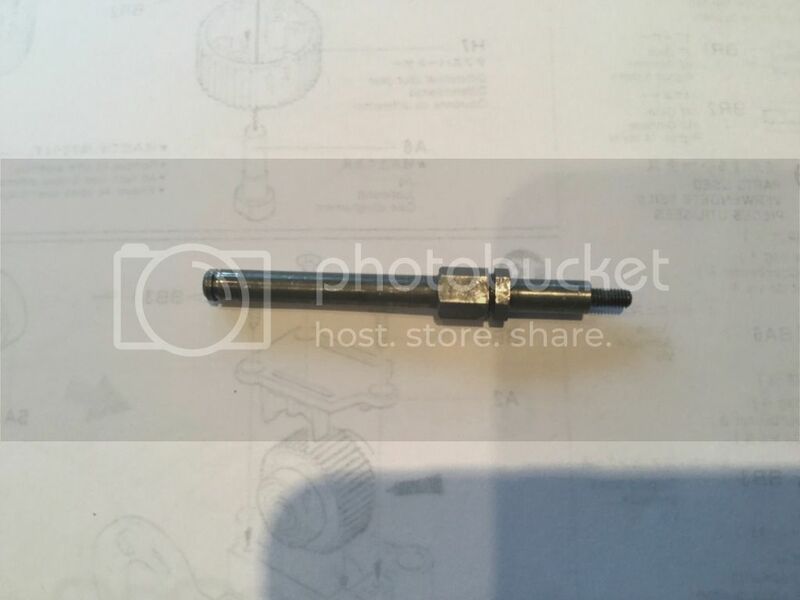 I haven t gone to check but I m sure gearcases are identical, the super astute just has another plastic part that slots into the hole on the left hand side where the main shaft exists the gearcase to carry the 840 bearing for the main shaft. I will check for sure tomorrow. As for the chassis I think, as does Max, that plates are identical, the astute does not use the 2 existing holes.that are meant for the super astute front battery holder.Again I will give confirmation tomorrow. This is what we had to start with. Lots of very old and very dirty grease in there. 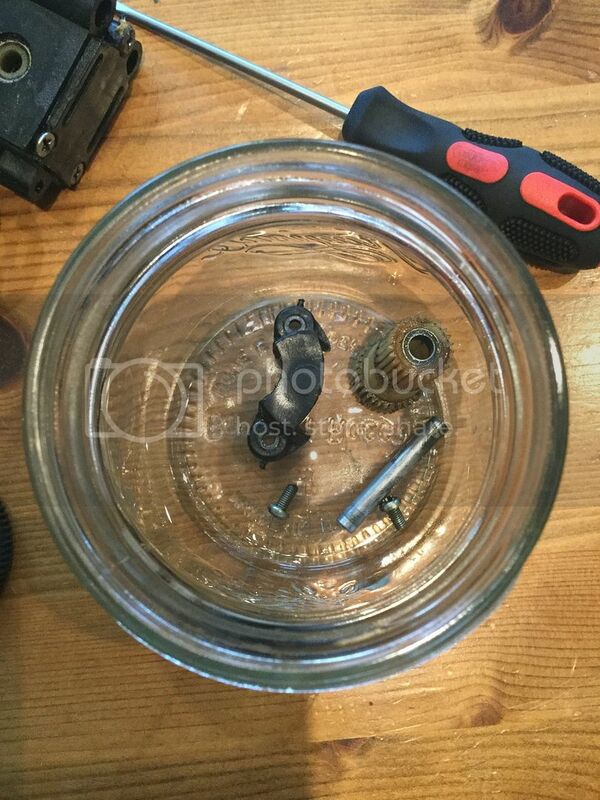 The screw holes have been damaged in the casing as the screws have been over tightened. One thing I have found throughout this strip down is that the plastics are cracked or damaged where self tapping screws are used. In order to eliminate this, I have read about a hot screwing technique where a soldering iron is used to heat the screw in position in the plastic until it just starts to smoke. The screw is then screwed in whilst hot, melting a thread in the plastic. This eliminates the stress cracks that form when a self tapping screw is inserted into cold plastic and in my opinion is a good idea. With the inspection cover off, I found that the gears inside were in very good condition. Since this is an Astute that has had a very hard life, this is a good indicator that the main gears are more than fit for the task with a little grease applied. 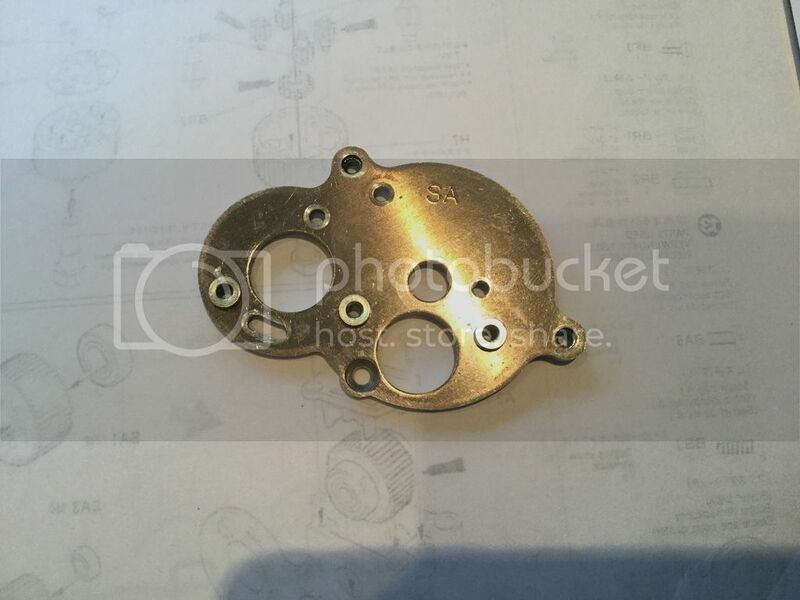 The motor plate cleaned up nicely be used again. You can see the marking SA for Super Astute for the unique motor plate for this variant of the car. Next is the main shaft. On this car the shaft seems to have held up and isn't bent of distorted so for this original build I will be reusing it.